MUH-TAY-ZIK | HOF-FER and Unit 9 London partner with Call + Response and the U.S. State Department to raise awareness about slavery today. 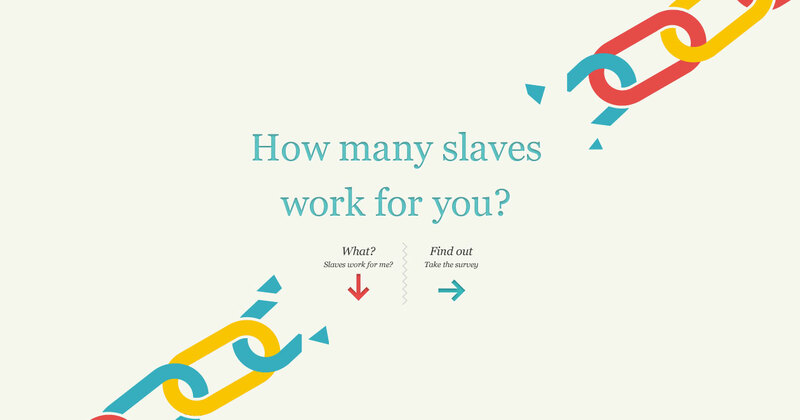 The site, called "Made in a Free World" allows you track how many slaves work for you, based on how many where you live, items of clothing you have, what you eat, gadgets you own and so on. An accompanying app lets consumers encourage brands to investigate how many slaves are used in their own supply chain operations. A geo-location element allows you to check-in to the app while you shop at these stores, and over a 1,000 Facebook pages will show how each store and brand is doing on the slavery front. Consumers that take the survey and work on encouraging brands to look into their practices will also win "Free World" points. The global slave trade is estimated to be over 27 million people working in supply chains for global products to create products like iPhones, cameras and running shoes. Often, the campaign says, major brands aren't even aware of the slavery footprint present in their own supply chains.